You really do have to love it when Apple gets itself in the mood to release a slew of updates for its major platforms. 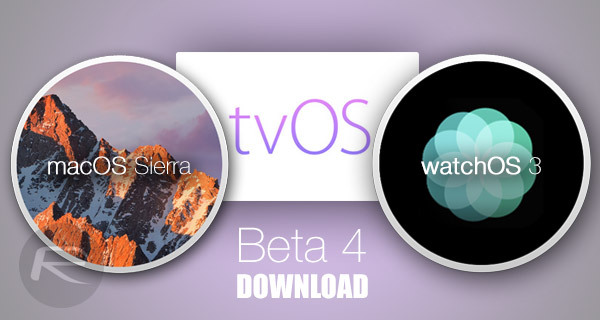 This time around, it’s good news for those involved in the testing of the current pre-release platforms, with that news coming in the form of fourth beta releases for macOS Sierra, tvOS 10 and of course, watchOS 3. With keen Apple fans already counting down the days to the official reveal of the next major iteration of Apple’s desktop platform, as well as the newly spawned Apple TV and Apple Watch operating systems this coming September, Apple as always is busy pushing out beta updates to iron out all the bugs and performance issues being brought to attention by developers and public testers alike. Now that the latest beta 4 releases of all three platforms are out, we’re going to take a look at what these updates have installed for early adopters, and what it spells for the final release. Depending on your perspective, this point in the life cycle of pre-release software is either extremely boring or very exciting. As you might expect from a fourth beta of a platform that was announced over six weeks ago, macOS Sierra is currently being pushed out to testers with bug fixes, stability improvements and overall security and performance enhancements. Those regular updates and fixes should see the platform in the perfect position to get live this coming fall alongside iOS 10 and the new iPhone. To some, seeing a platform develop and mature is exciting, whereas to others, it’s mundane to not have outward-facing changes to interact with on a release-by-release basis. Whatever your mindset happens to be, the fourth beta seriously stabilizes macOS and excites us for what’s to come. As always, those developers and testers who have a previous pre-release seed of macOS Sierra installed on a compatible iMac or MacBook are able to go directly to Apple’s Mac App Store and grab the latest fourth beta as an over-the-air update. macOS Sierra beta 4 is currently not available to those registered on public beta program, but it should soon. watchOS 3 is a fairly big update. Apple Watch owners have things to look forward to, such as instantly loading apps, and even new animated watch faces to boot, among other things. This latest beta release continues the progression of the platform, and although it doesn’t introduce any major outward-facing changes for developers and testers to interact with, it does contain a number of enhancements and big fixes. For those that already have an existing pre-release seed of watchOS 3 installed on their Apple Watch, the option is now available in the accompanying Watch app on iPhone. Simply visit the Software Update mechanism to grab the fourth beta right now. If this is the first time you’re attempting to install watchOS 3 beta release on your Watch, you will first have to install the configuration file from developer.apple.com to grab the firmware. This of course requires you to have an active membership of the Apple Developer Program. Apple’s fourth-generation Apple TV is one of the most exciting products that we’ve seen from the Cupertino-based company for quite some time. The company isn’t reinventing the wheel with this product, or making a new marketplace, but rather looking to build something that’s extensible via tvOS with the aim of taking over the living room with a single hardware and software combination. tvOS 10 is paramount to that success. This latest version of tvOS 10, very much like the previously released beta, focuses on fine tuning and enhancing the existing experience rather than integrating new features. To get up and running with the tvOS 10 beta 4 update, if a previous beta version is already installed, you can grab the update directly from Apple TV itself, otherwise you will first have to grab the update from developer.apple.com, and of course this requires you to be an active an enrolled member of the Apple Developer Program.